Today, we are going to see the best collection of responsive fitness WordPress themes for gyms, personal trainer, weight lifting training, cross fit training and workout websites. These fitness WordPress themes are specially designed to create sportive websites and showcase the services and package offers. You will find all mandatory features to create any kind of online gym/fitness oriented websites. Here, we have collected only the best design that we found around the theme developers. GymPress WordPress Theme is specially designed to use for sports, gym, fitness and personal trainer sites. ProteusThemes developer club has designed this theme. You can simply create a powerful design that every gym needs in order to attract new members. GymPress WordPress Theme is a responsive web design that supports to work on all smartphones, tablets, desktop and laptop devices. It has tested on Google mobile test browser to load fast and quick on all mobile devices and SEO ready! 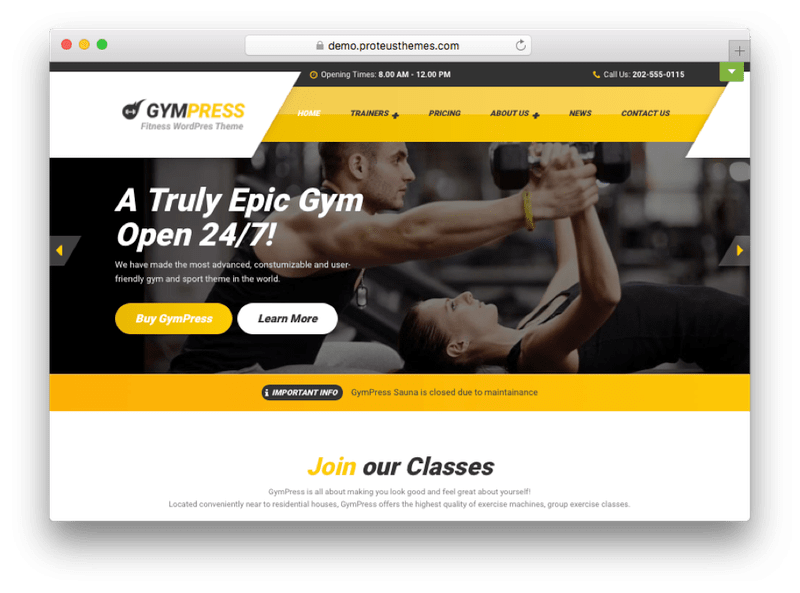 GymPress theme built with this plugin latest technology like HTML5, CSS3 and clean high-quality code by professional WordPress developers. The homepage is fully customizable with drag and drops visual composer page builder plugin that chooses from 30+ widgets to create out of box website for your clients/visitors. In Shape is an ultimate responsive WordPress gym theme from ThemeFuse developer club. This theme is totally unique and fantastic design compared to other WordPress fitness themes. In Shape, WordPress theme was designed with a responsive web design that comes with all necessary features to create gym websites. It would be the best choice for a personal trainer, gym, fitness, cross fit, weight lifting, and sports-related websites. The homepage comes with multiple slider options to showcase promo banners, built-in event calendar to book online appointments by using visual composer plugin shortcodes. Create your own custom page layout with 30+ visual composer widgets and one-click demo content installation. Since it has been built with powerful Unyson framework, you will have airtight security and advanced features to customize your website. The Divi WordPress Theme is a multiple purpose responsive WordPress theme from ElegantThemes developer club. Generally, it can be used to create any kind of online business or blog websites. In the part of Gym & Fitness web design, it is produced lots of pre-built CrossFit/gym/fitness templates by Geno Quiroz. Since it is a drag and drop page builder plugin, it will allow you to build your own custom fitness/gym website for your clients/visitors. It comes with all necessary features to showcase your gym services, such as scheduled classes, personal trainers, showcase photo galleries, workout videos and full-screen mode. JustFit WordPress Theme is another great responsive WordPress theme from MyThemeShop developer club. This theme will suit for all kind of fitness-oriented websites, such as fitness community, fitness magazine/news blog, personal trainer/coaching, and exercise, weight lifting, and cross fitness websites. the theme is fully customizable with drag and drop widgets of Visual Composer page builder plugin that allows you to build or customize your own web page layouts for your clients/customers. The design is very unique and you will see Gym font icons to display the categories and fitness services. It is well optimized for search engine and speed load on all devices like smartphones, tablets, desktop, and laptops. Additionally, JustFit WordPress Theme is also supported to create an online store by using the WooCommerce plugin. It will help you to sell fitness proteins, equipment and accessories online! Olympic is a 100% dedicated responsive WordPress fitness theme from cssigniter developer club. 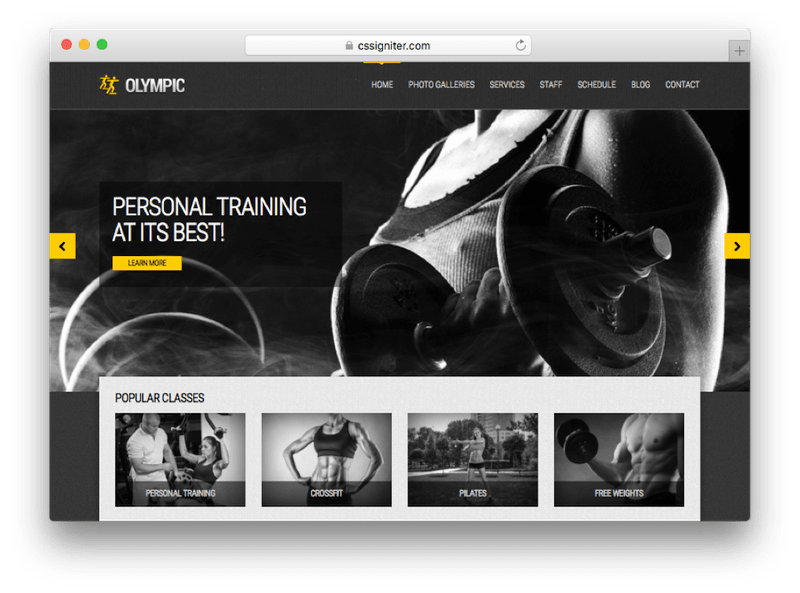 This theme is a clean and perfect online gym WordPress design that comes with plenty of features to showcase your services, such as gym photo galleries, personal training, cross fit, Pilates and weight lifting tips on blogging section. It is also coming with an event calendar plugin to manage class schedule and ask the people to join your gym. Olympic WordPress Theme supports popular page builder plugins, such as Elementor, free SiteOrigin Page Builder, and The Divi builder plugin. This plugin will help you to create an out of box website design with drag and drop widgets! 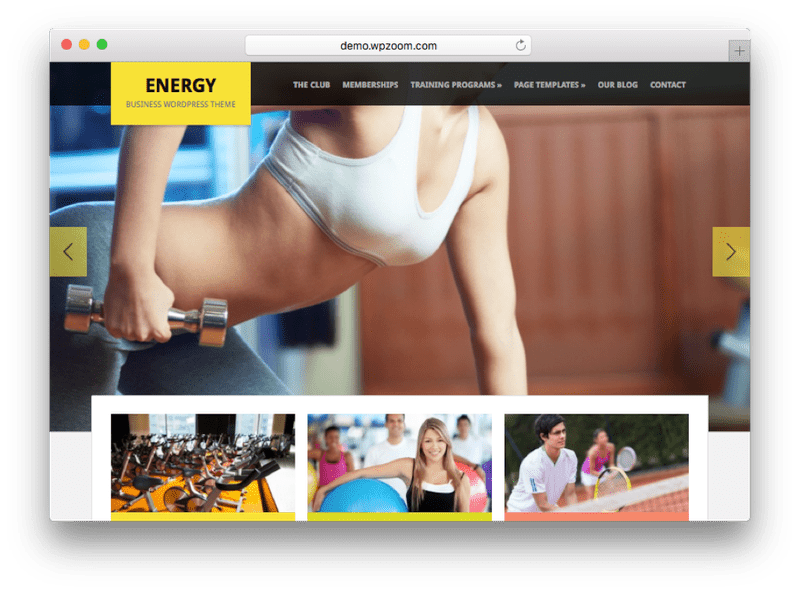 Energy WordPress Theme is a responsive WordPress gym theme from WPzoom developer club. This theme is ideal to use for the fitness center, gyms, sporting venues, and personal trainers to showcase their services. Energy WordPress Theme is well optimized for search engine and fast loading on smartphones, tablets, desktop and laptop devices. It comes with 2 different header designs, custom page templates, full-screen slideshow to showcase products and service on the page. Energy theme is built on a powerful WPzoom framework and dynamic homepage builder with multiple widgetized areas. FitnessLife WordPress Theme is another great responsive Premium WordPress fitness theme from WPLook developer club. 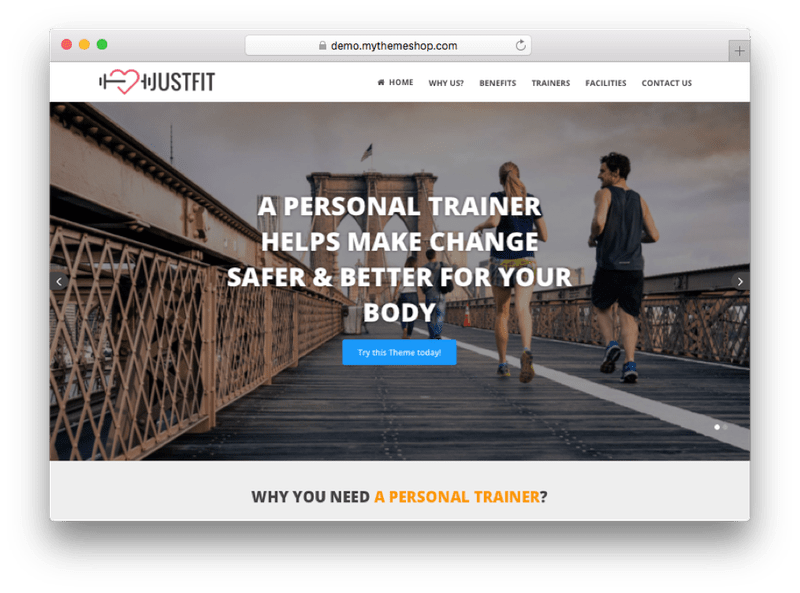 This theme design is a completely dynamic structure that helps you to showcase your personal trainers, gym classes, fitness training tutorials, healthy eating tips and create an online product store to sell protein/supplements. Even you can schedule the gym classes for personal training and you will great features that need for a gym website! 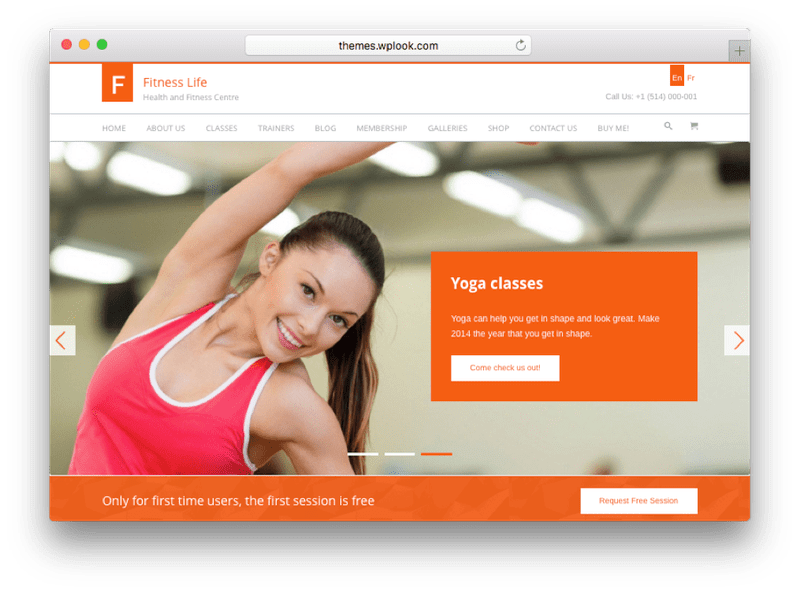 FitnessLife WordPress Theme comes with advanced theme panel options, membership plans to join your gym, display pricing table, 5 custom post types and 9 custom widgets, WooCommerce shopping plugin and much more. Gym & Fitness WordPress Theme is a responsive Web design from WPLook developer club. It has the same features as FitnessLife WordPress theme! Additionally, you will find some features on setting up an online store, integrated PayPal payment gateway for receiving payments online, schedule online class with pricing table, book classes online, personal trainer’s coaching, regular blogging tips section and online store with WooCommerce plugin! Gym & Fitness WordPress Theme will be a modern design that helps you to build a clean and elegant gym website. 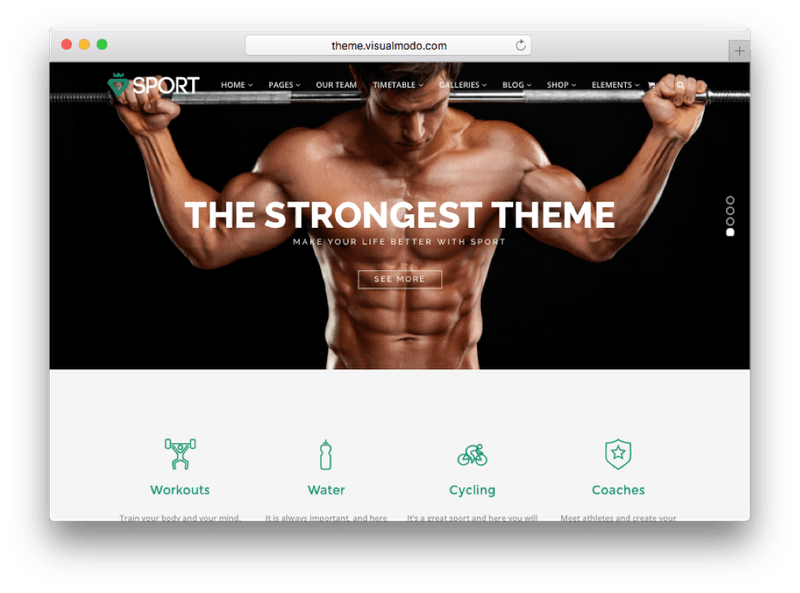 Sport is a performance-based responsive WordPress fitness theme from VisualModo developer club. This theme is specially designed to showcase gym, fitness and weight lifting workout websites. The Sport WordPress Theme comes with advanced resources to create pixel perfect responsive web design for fitness websites. It is designed with a drag and drop interface that allows you to create and showcase contents, media, and galleries of the gym. Additionally, it has been used latest technologies like HTML5, CSS3, and JS framework for developing the responsive and mobile first design. There are also more features like slider revolution, WooCommerce, Google font integration, gym fonts, Google maps and much more. Fitness is another great responsive WordPress theme from VisualModo club. 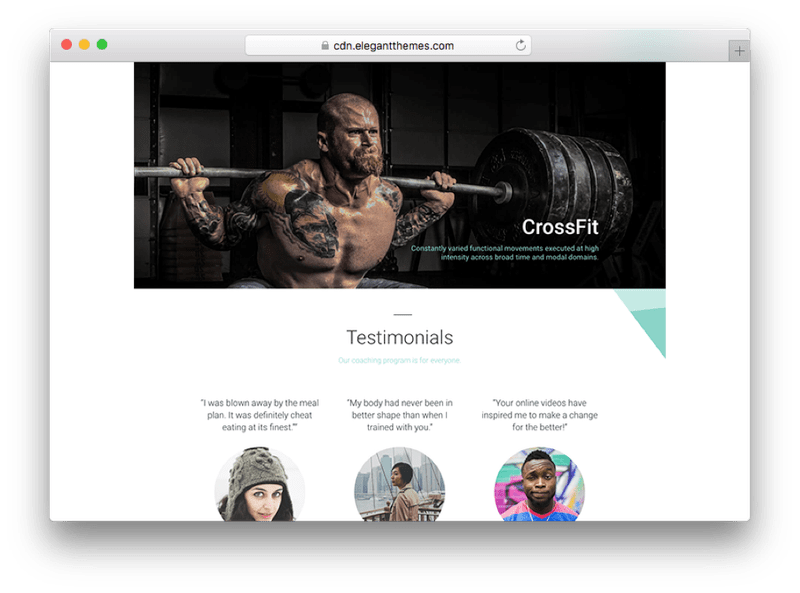 This theme is a simple and clean classic WordPress theme for fitness, gym, and personal trainers websites. You can showcase all necessary services and classes in the right direction. Fitness WordPress Theme is built on the visual framework, which is a rock-solid code base by professionals. 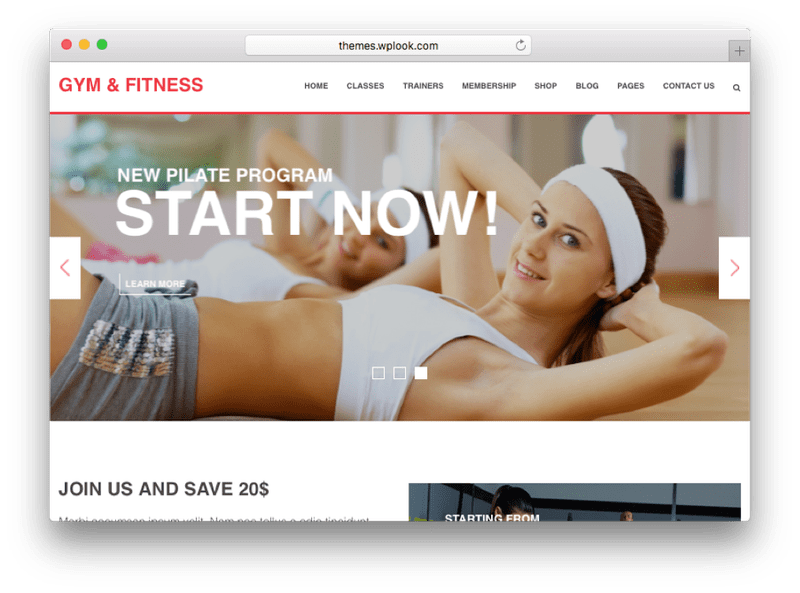 There are plenty of amazing features included on Fitness WordPress themes, such as personal trainers page, activities in the gym, gym/fitness gallery, the timetable for classes, forums to discuss workout and weight lifting options. You can simply create an ultimate and out of box web design for your gym or fitness centers. 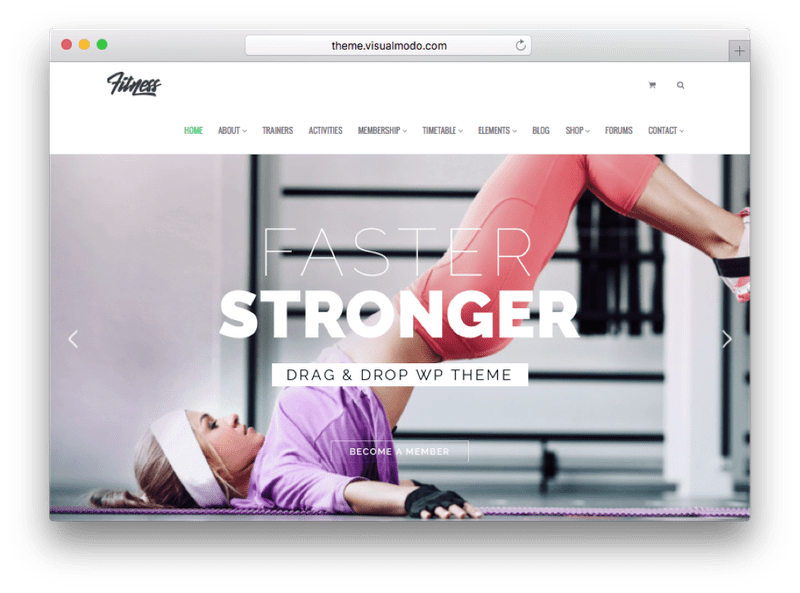 If you find any best WordPress fitness themes then feel free to share it here!